BMW's i3 electric car will be priced at about $40,000, or roughly the same as a well-equipped 3-series sedan, says Ludwig Willisch, CEO of BMW of North America. The i3 will have an optional two-cylinder, 0.65-liter gasoline motorcycle engine and an auxiliary generator that charges the battery. Willisch did not indicate what the price might be for that version of the car. The i3 likely will qualify for a $7,500 federal tax credit, although a BMW spokesman said the company has not completed discussions with the federal government. 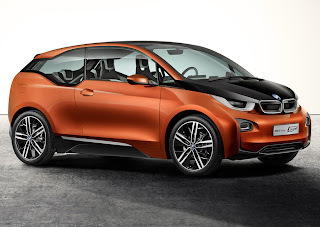 BMW also is waiting to hear whether buyers of the range-extender version can get the full $7,500 credit. In an interview, Willisch said BMW will establish a program that allows i3 owners to borrow a conventional gasoline or diesel vehicle for a longer trip. Details haven't been worked out, but the service will be offered "as an additional mobility package," he said. Most of BMW's 338 U.S. dealers are expected to sell the i3 and the i8 hybrid sports car that goes on sale next spring.